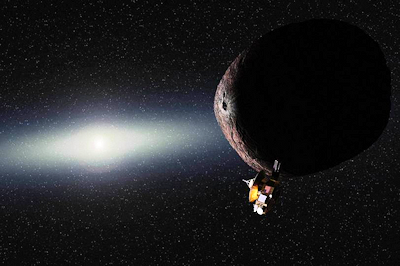 Artist's impression of NASA's New Horizons spacecraft encountering a Pluto-like object in the distant Kuiper Belt. NASA announced today (Aug. 28, 2015) that it has selected 2014 MU69 as its first choice for the probe's secondary mission. NASA's New Horizons probe, which flew past Pluto last month, now has a second target to aim for. The New Horizons team has selected an object named 2014 MU69, which lies roughly 1 billion miles (1.6 billion kilometers) beyond Pluto, as the next target for up-close study by the spacecraft, NASA announced today (Aug. 28). In 2014, Hubble identified five objects that New Horizons could potentially reach after its encounter with Pluto. The list was later narrowed down to two prime candidates, including 2014 MU69.